Debra E. Stalk, MPH is currently the Associate Director of Admissions at the Rollins College Crummer Graduate School of Business where she oversees enrollment and sytems management for the school’s top-ranked MBA, graduate and doctorate programs. 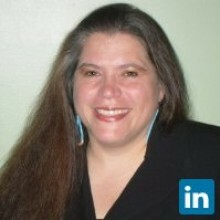 Ms. Stalk brings over 20 years of experience in higher education in areas of admissions, program development and enrollment management focusing on technology which creates paperless work enviroments. Her responsiblilites include recruitment and retention of qualified applicants for enrollment into the Crummer Graduate School of Business. Her previous experience includes being a part of the founding staff and faculty at The Commonwealth Medical College where she served as the Director of Admissions and Associate Director of the Masters in Biomedical Science Program. This position included the writing, editing and submission of accreditation documents related to admissions and diversity initiatives for the creation of the 130th medical school in the United States. In this role, she also served on the AMCAS Advisory Board. Debra's background also includes student affairs, diversity education and program management at NYU School of Medicine where she founded the Native American Mentoring Program, managed grants, scholarships and programs for graduate and medical students and served on the Board of Directors for the Society of Advancement of Chicanos and Native Americans in Science.